When Apple introduced the iPhone 7 a lot of people got their hands on the head knowing that the device did not have a mini jack connector for headphones. The most common complaint was that lacking the port it was not possible to listen to music or make calls with headphones and charge the battery of the device at the same time. Since then the complaints seem to have stopped somewhat, but it is true that the problem continues to exist for all who prefer wired headsets instead of cordless ones. Does this problem affect you? Are you one of those who prefer wired headsets and in many cases need to connect them while charging the battery of your iPhone? If so, the accessory that we will discuss below is of interest to you. The Ubittek brand has released an adapter that allows having two Lightning ports on an iPhone, iPad or iPod Touch with iOS 10 or higher. The accessory is simple and very easy to use. 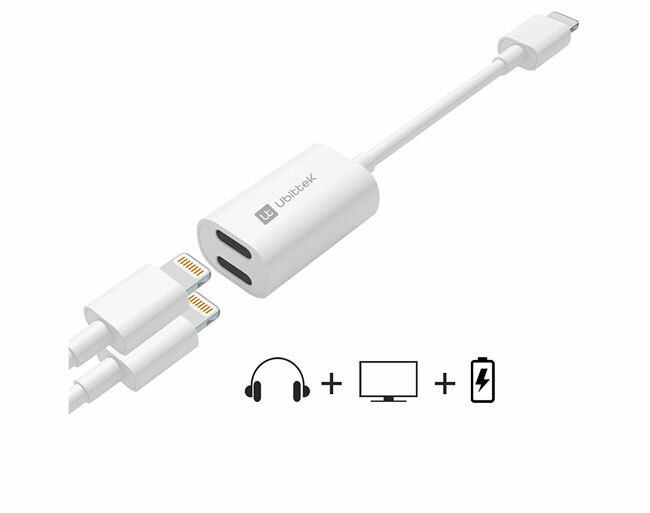 Basically, it is a dongle that has two Lightning ports at one end and one at the opposite end. On the side where the two connectors are, you can connect a headset with a Lightning connection and the charger or USB data cable. Once connected, simply plug the other end into your iOS device. The accessory will automatically handle everything and thanks to Lightning technology the iPhone will detect that there are connected headphones in addition to the charger or sync cable. The brand ensures that the accessory does not reduce the audio quality of the headphones and offers exactly the same as if they connect directly to the Lightning port of the iOS device. In addition, the handset remote control will continue to function normally. The Ubittek Dual Adapter is available on Amazon in white. A safe purchase if you usually use headphones while you’re loading your iOS devices.